Welcome to the Ferrari Dino 208 & 308 GT4 Registry! An online database of chassis, engine and transmission numbers, as well as vehicle colours, specification, history and current location. Ordinarily, owner's names are not published for privacy reasons. Many thanks to Carl Atkins, Gianni Codiferro, Mike Dawson, Erik van den Eijnden, Thomas Gonnella, Frederic Gully, Carl Jones, Michael Platzer, Neils Schouten, the late Denny Schue (who past away on June 17th, 2006. Without him, this Registry would be nowhere near as full as it is now. ), Michael Sheehan, Dave Stacy and Mike Wheeler for providing a large part of the information contained in this Registry. The email address for this website will be changed in the future. Please see the email link below for more information. 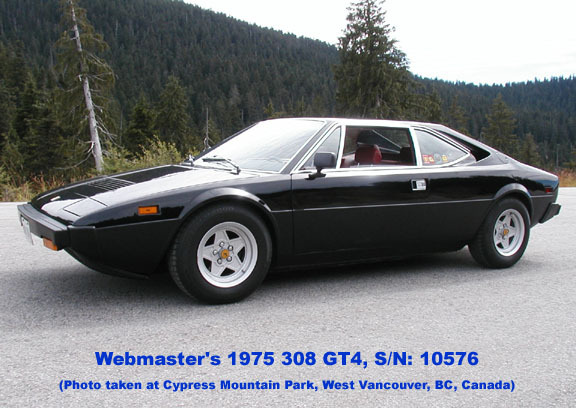 Note #1: The GT4 model range had as an option, the Berlinetta Boxer lower matt-black paint scheme (code #: 20-B-50). In this list, that colour specification will be described as: "-Boxer". Note #2: The range of serial numbers per year are an estimation only. to your address book (replace 'at' with the proper "@" symbol). Thank you and check back often to this page for further updates.